Is your meat rare, medium, or well-done? There are many factors that will affect how quickly meat cooks, such as the oven temperature, the thickness of the meat, the presence of a bone, or the percent fat within the meat. For this reason, time and temperature cooking charts for meat should only be used as a suggestion. Although internal meat thermometers are the most accurate way to determine the doneness of meat, there are times when thermometers are not available or easily used. In these instances, a combination of color, texture, and suggested time and temperature charts can be used to determine if the meat is properly cooked. Below you will find the characteristics of rare, medium, and well-done meat, including their color, texture, and the correlating internal temperature. The color descriptions below are in reference to whole cuts of red meat only. Pork, other white meats, or ground meat should not be judged for doneness based on their color. Temperature: According to the USDA, the internal temperature range for "rare" cooked meat is 136 to 140 F (58 to 60 C). Most meat is deemed safe from bacterial danger at 140 F. It is important to consider carryover cooking when trying to achieve a specific internal temperature. The internal temperature of meat can rise as much as 10 to 25 degrees (depending on the size of the roast) after being removed from the oven. Appearance: When cooked to a rare state, red meat remains rosy pink to red in the interior, may be slightly gray near the surface, and only the outer crust becomes brown. Rare cooked meat is extremely juicy and the juices will remain bright red. Texture: The texture of the raw-cooked meat is very flaccid. The texture can be compared to the soft fleshy portion of the hand located between the thumb and index finger while letting the hand lay limp. Temperature: An internal temperature of 160 to 167 F (71 to 75 C) is considered "medium" cooked meat. Once again, keep in mind carryover cooking when trying to achieve a specific internal temperature. Appearance: Red meat cooked to a medium state will have a nice brown crust and the interior will be slightly brown to light pink toward the center. Although the center is pink, it should not be as bright red or rosy as rare cooked meat. Medium cooked meat will not be quite as juicy as rare meat and the juices should appear slightly pink, rather than bright red. Texture: The texture of medium cooked meat will be slightly more firm than rare cooked meat. It is comparable to the fleshy part of the hand between the thumb and pointer finger when the hand is outstretched. Temperature: Meat cooked to an internal temperature of 172 to 180 F (78 to 82 C) is considered "well-done." Cooking to temperatures beyond this will cause excessive dryness. Appearance: Well-done meat will have a very dark brown exterior crust and the inside will be completely gray/brown with no trace of pink or red. Well-done meat will have only small amounts of juice which will run completely clear. Texture: The texture of the well-done meat is quite stiff and can be compared to the texture of the fleshy part of the hand between the thumb and pointer finger when the hand is held in a tight fist. 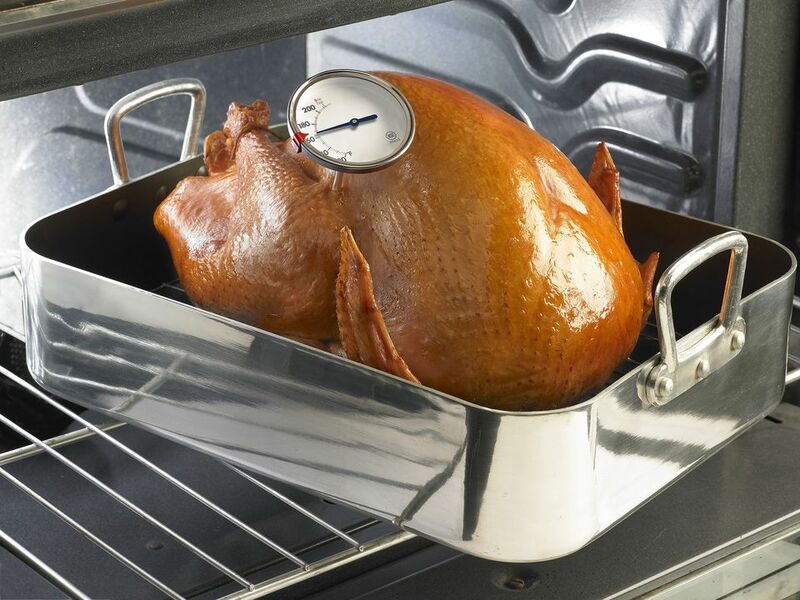 Remember, if a meat thermometer is not available, use a combination of techniques to determine if your meat is done, including suggested time and temperature cooking charts based on the type and size of meat being cooked.